Well, it doesn’t weigh a ton but look at all that chocolate! Guylian, Thorntons, Chocolate & Love, Lindt and more are all there and they could all be yours! I have no idea how much it would cost if you went down to the shops to buy all this chocolate but given there seems to be over a kilo of it I am sure it wouldn’t be cheap! I have had a terrible Year of the Dragon, having lost my grandfather, mother in law and almost my husband to food poisoning. Almost every white good in my home decided to break at the same time, I’ve gained weight and I didn’t get a discount on my annual train ticket to London which I have to buy for work. I know I’m broke, stressed and ready for the Chinese New Year when the stars will fly and hopefully things will get better (I am a trained Feng Shui practitioner and know both Flying Stars and Eight Mansions styles) and I assume some of you, my dear readers, are too! I decided that given how dire my year has been, and how bad some of yours have been given what I’ve seen on Twitter, that EVERYONE needs a bit of a pick-me-up so what I thought I’d do was have a competition for everyone in the UK (this is so heavy I am fearful of what the cost would be for international shipping). 1.The competition will finish at noon GMT on Sunday 20th January 2013. I’m hoping for a year with no health problems – last year my husband, my dad, and I all ended up in the hospital for various surgeries. I just don’t have the energy to worry about that this year so here’s hoping! Like the previous poster, I am hoping for a year when everyone I love has good health. As a very greedy extra I would like to be solvent this year too, and not having to watch pennies! I have started keep fit classes and am looking forward to toning up and losing weight. I’m hoping that my Dad continues his surge onwards into his 92nd year, that my wife’s parents have one of their better years health-wise, that my wife’s health problems show some improvement, and that our cats adapt to the changes necessitated by their kidney and thyroid problems. Oh, and that I continue to appreciate the love they all unfailingly show me. I am hoping for good health and good times for my friends and family. I’m hoping for a year with better health, more energy and more activity. Last year was pretty rough for me, I had a lot of ongoing health issues to recover from, but I like to keep busy and active as it helps a lot. I’m also looking forward to finding fun new choccies to review! I’m hoping that my mum’s health continues to stay stable, that the rest of my family remain well and that I am able to put the stress and worry of last year behind me and be happy again. Fingers crossed for a happy, healthy and fortuitous 2013, despite the unluckiest associated with it! To looking after myself more as I feel a little bedraggled! I am hoping for a year of tears of joy not sadness. im looking forward to getting fit losing 2 stone and getting some amazing new summer clothes 2 show it off! I’m hoping that we will be able to get through the year with out worrying about money too much! Would love it to be a nice easy year for me and my family. I would like everyone to be well and happy and to enjoy life! Cannot be any worse than the Dragon of last year! There is no question, I pray every day for my mum’s cancer to disappear! I’m looking forward my daughter finally learning how to sleep past 5 am! Plus I’m hoping joining weight watchers this month will see me fiting back into my clothes. After a few health scares at the end of the year I hope to loose weight and that everything will settle down now. eat more healthier, walk more and be more positive about life. im looking forward to see my parents after 3 years no see them. they in different country. I’m looking for a positive year with no more stress and health problems for my family. Looking forward to a steady year ahead, minor improvements in health would be good, but stability is the main thing. Seeing Kaiser Chiefs on tour, that means a good night out, a lot of fun and all my friends. I’m hoping that this year it wont take me too long to reach my final stone in weight loss. Last year I lost 5 stone… this year I need to lose 13lbs more. This stack of chocolate may set be back a while! I’m looking forward to my youngest son and his fiance coming home from Oz in March and my oldest son getting married in April. Im looking forward to my little boy growing up and hoping for a year that’s full of luck, happiness and good health! im hoping for a year where my daughter can get the extra help she needs in school. I really want to find a job and help my family out financially – been a stay at home mum for 11 years and now kids are older I am really hoping to be able to get out more and earn money. I’m a snake and my mother is a snake and good things happen to us when it comes around. Anything could happen this year. now i’ve got my two youngest diagnosed with autism, i am hoping to learn more about the condition and how i can help them. i hope to get them settled into a good school and then i can start to relax and give myself some time for me. This past year has been one of the worst in my 56 years. Had many major health problems, too numerous to mention. Partner lost his job of 32 years and worse still I lost my mum to Parkinson’s. horrible death. Am recovering from a lung infection which should be cleared by Chinese New Year. Here’s wishing for a healthy and prosperous one. I’m looking forward to moving cities for a change of scenery. My other half just got a job after being out of work for a few years. He’s only on a three month trial but I hope it’ll become permanent so we can have some financial security for the future. I am hoping to get pregnant this year, after a miscarriage in early december 2012, I know I’ll make a fantastic mum so I hope my dream comes true this year. I’m also hoping my mum will finally ger her double knee replacement operations as she is in a lot of pain and we have so many plans together (travel) but she finds it hard to get around right now. I’m looking forward to better health (hopefully) and some sunshine (also hopefully). Also looking forward to spending time in the garden. Like many, am hoping for a healthy and happy new year with the extra hope that the roof stops leaking! I’m hoping for a year full of fun and sunshine with a rich sweet start and a lingering, melting middle. Hopefully I’ll get to the bitter end without getting bitten! I’m looking forward to starting Chinese New Year celebrations with a family meal and chatting to friends in Hong Kong. I hope the year of the snake is a good one, with great weather and happy times to look forward to. I’m looking forward to another year’s work load (I’m self-employed) so no need for any short term worry (touch wood). I have had the flu since New Years Day so I am hopeful for better health this year. I’m just hoping to feel better – have been coughing, spluttering and not sleeping for 3 weeks now – bah! Actually, I’m hoping for a stress free year, that would be sooooo wonderful. Fabulous giveaway BTW and I hope you have a much better year. I’m looking forward to catching up with Echelon from around the world as 30 Seconds To Mars embark on a new tour with a new album. Can’t wait! I’m looking to improve my health levels, reduce my stress levels and get back to doing a bit more exercise. Looking forward to the Chinese new year of the snake as it starts on my son’s birthday, so a chinese themed birthday party/sleepover is kicking it off, then the year itself is full of special birthdays, my daughters 18th, mum’s 70th, so realy looking forward to what is hopefully going to be a fantastic year of the snake. I am looking forward to my husband’s health improving enough for us to enjoy a short break later in the year. He has had pneumonia 3 times this year and is still quite weak. Hopefully I can lose a bit of weight during the year of the Snake, then the chocolate will be guilt free during the year of the Horse! I hope to get out and enjoy life more,especially visiting new places.I barely ever leave the house so I am determined this year will be different! The year of 2012 an up and down hill battle. I don’t think anyone found it easy at the best of times. This year, I’m hoping for a full recovery from Anorexia, as a sufferer for three years, my ex partner of six years decided to break it off with me, as she didn’t want the burden of my eating disorder. I just want to find my inner strength and beat this, and maybe come out on the other side, being able to help suffers just like me. I wish you a much better year, Judith…you most defiantly deserve all the chocolate in the world, you’re a true inspiration for strength. im looking forward to moving into our new family home, with a garden for the first time. new beginnings! I am looking forward to a holiday with friends in Spain. I hope to finally get a full-time job again and get on with enjoying life again. I am hopeful that now I am recovering from chemotherapy I will be able to resume doing all the things I have been unable to do such as vacuuming, shopping and ironing. I’m hoping to get through the coming year without getting too stressed about all the things that I can’t actually change. I’ll stick to worrying about things that I can do something about. I am looking forward to my daughter starting school in the summer she’s just so excited about being a big girl. To stop slithering around and have a hissing good time! I am looking forward to my children blossoming into a successful adulthood. 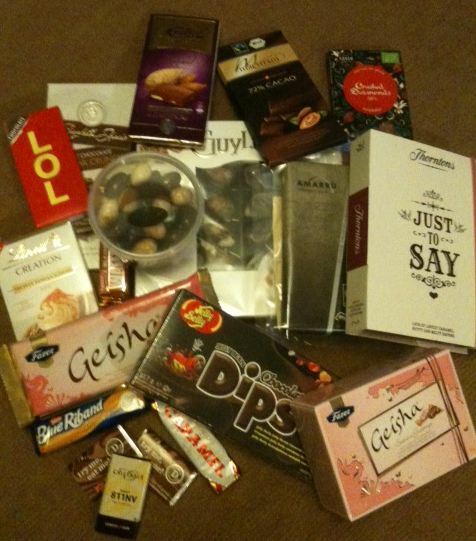 I hope for a better year by winning all this chocolate! I’m looking forward to my second holiday with my boyfriend, to spending time with my friends and to the new series of Sherlock. We’ve been looking for a house to buy for over a year, may it come up this year. And a baby please! I’m looking forward to finally being able to live with my partner who is stuck dealing with family problems overseas. I’m not hoping for anything in particular this year, my only wish is that is more of a positive one than last year…it ended pretty bad. The same as many others, I’m hoping for a better year healthwise, particularly my dad’s cruel illness. I’m looking forward to getting back out on the allotment, lots of fresh air, hopefully some good weather so the veggies grow well. I’m looking forward to a very positive and happy 2013!! I’m hoping to make some sort of big changes this year like trying to get my own place and getting myself fit. For my family to be happy and healthy and to enjoy my daughter turning into a little girl! I look forward loosing weight and getting fitter, and spending more time with my family. I am hopeful that in this new era everyone on this earth will be fed and treated fairly regardless of colour or creed. A world where we can coexist peacefully. I am hoping that the year of the Snake will bring an end to War and return our armed forces to their loved ones. After being made redundant in 2012, I hope that I find a new job. I am hopeful for a little baby this year. My very first. Looking forward to getting fit and treating myself to some pampering facials & other beauty treatments….about time I started looking after myself! This year of the snake i wish to be financially secure,determined to accomplish my goals ,i wish for lots of fun and laughter,sunshine and good times.Good luck. I am really looking forward to my best friend having her first baby in few months – a mate for my little one. I’m hoping for an “all clear” CT scan in march, then I can go on holiday to Australia to visit friends with a happy heart. In this year of the snake I just want my family to be happy and healthy. Any other good things after that will be gratefully received but if you have health and happiness that’s the main thing. Not particularly hopeful for anything, but a year without major illnesses, accidents and disasters would be nice. I’m looking forward to hopefully a year with no-one being ill, a decent summer for a change, and most of all the special delivery a new baby girl in the family in the Spring, I’ll be an auntie again. I’m hoping for a year with less stress and to earn a little more to afford the odd luxury, such as… chocolate! I’m looking forward to finally dealing with the swamp in my cellar and the tree that’s growing in the chimney. I’m hoping my daughter will be successful in gaining her degree, I’m sure she will. And I’m going to try to develop and keep some strength in my legs, MS isn’t making that easy, but I’ve borrowed my parents’ exercise bike and I’m going to try. I am looking forward to a brighter year. I am going to stop making excuses and go for the things I love instead of finding ways out of it! This year of the Snake I’m really looking positively towards the future; I’ve recently left uni so want to confirm getting my dream job (hopefully within the next month! ), I also want this year to be super healthy and possibly start trying for a baby too! I’m looking forward to the school summer holidays. Now my son is 7 he’s good company to be with. I’m looking forward to watching my baby boy grow into a little man! Spending time with my family, friends and especially my husband. And eating lots of chocolate! I am looking forward to spending a few weeks in Wales this sspring. I am looking forward to going to America this year (if we can afford it) to see two of my Nieces get married within the same week in two different states! I’m looking forward to spending time with relations as we get together on our summer holiday. We always enjoy. I’m most looking forward to progressing with my studies and extending my family and winning lovely prizes. This year I turn 40 and although I’m dreading it everyone tells me life begins at 40 so I’m waiting in anticipation to see what good things come my way! I am hoping for a pay rise for my husband, he works so hard and travels further than we would like for his job so this would sweeten the drive a little. I hope my son gets into the secondary school we have applied for. I hope I lose a bit of weight and succeed in drinking less wine!! I hope my family are all happy and healthy. I’m looking forward to a short holiday later on in the year. I would like to get fitter and lose some weight. I also wish all of my family health and happiness. travel and study and eat more yummy chocolate like this. Year of the snake, dancing on ice back on – how come Jason gardner’s name keeps slithering through my mind! I am hoping to find a perfect job, and find new chocolate to try. I’m looking forward to days when the sun shines. Perhaps it won’t rain every day next year! Looking forward to sunshine in the summer, healthy family and friends, time off work and great holidays! Going back home to Australia for holiday (Been 5 years). I am definitely looking forward to the year of the snake. I’m looking forward to my family holiday in the summer and lots of great walks and days out with the hubby and kids. I am looking forward to spending time with my family & eating lots of chocolate! Like a lot of others, I am hoping for better health for myself and my friends and family. And I also want to send out positive vibes for everyone to have a good 2013! I hoping to keep up the exercise this year and see a further drop in my waist size. Family time !!! Hubby been forced to take a lower paid job. But although massive pay cut and stress of that. Upside is he be home when he says he will and so our son will reap the rewards. I’m looking forward to using my free time more craftily! More stitching, baking and creating! keeping positive about going to uni at the end of the year!!! Hoping to find a small part time job, stay healthy and hopefully wealthy! The year of the snake is one of success and that is what I dream of (and the most delicious, decadent chocolate that makes you thin of course!). Judith, I’m so sorry for the loss of your grandfather and mother-in-law. I wish you and your family many blessings in the coming year. What I’m shooting for this year–I will complete my novel and get it submitted to my first-choice publisher, and I will finish the decluttering of my house, which I’ve been working on in slow sections for more than a year. Im looking foward to a new start, new job and new me and lots of choc! I am hopeful that some of the good feeling and positivity created by the Olympics in 2012 will carry over into 2013 and we will all be much less gloomy as a result. I am looking forward to the birth of my first granddaughter who is due next month. I am looking forward to lots of chocolate to share some with my family but mostly to eat myself! I’m looking forward to winning competitions this year – hopefully starting with some chocs! I am looking forward to the safe arrival of two new grandchildren, one from each of my sons wives bringing the total to four. I’m looking forward to 2013 being a year of possibilities and adventures, starting with taking my Dad on his dream holiday to the Grand Canyon. I hoping all my friends and family have a great year but for me, I hope that I can get my business off the ground and end up a success doing something I love. I’m looking forward to hopefully having good health, wealth and luck but most importantly that all my loved are happy and healthy. I am hopeful that I will gain a First Class BSc (Hons) Life Sciences degree. I start my final module in 2 weeks and lots of chocolate = glucose = fueled brain for studying!! If not I would love to get promotion at work, I’ve passed the exam just need to be successful at the interview stage. I am hoping for a fresh start this year, I am going back to college to change careers to get away from the horrible one I was stuck in. Fingers crossed for the future! A successful and prosperous year (hopefully) And finally getting my drivers license! going to see my new grandchild – who is half chinese! Good fortune and good health, and hopefully a good lottery win! Would love it if my son or daughter got around to making me into a grandma!! I am looking forward to my Mother’s 70th Birthday – she has had health worries but she is now out of hospital and doing well – the whole family is planning something special for her. I’m looking forward to my son’s wedding in New Zealand! For my cold to go away, to get my allergies sorted and start my own blog! A lottery win would be nice too …. I am really hoping to find a job that fits in with school times in September when my son starts school, I know they are very rare so here’s hoping. It would really take away some of the financial strain. I am hoping for good health for family and friends and better job opportunities for all. I’m hoping to conceive my first child this year after having a tough last couple of years with medical problems ! Oops, read that as maximum of 10 words! I’m hoping for a new challenge and to stick with my resolution of being positive – it makes for a happier life. Im hoping for my husbands arthritis treatment will work enough to actually get him able to walk more then 30 mtrs without extreme pain. I hope that my efforts will be rewarded this year, and I will be able to enjoy more time with my family. ThisThe Snake in Chinese traditions is a good family provider and will always look after its own.